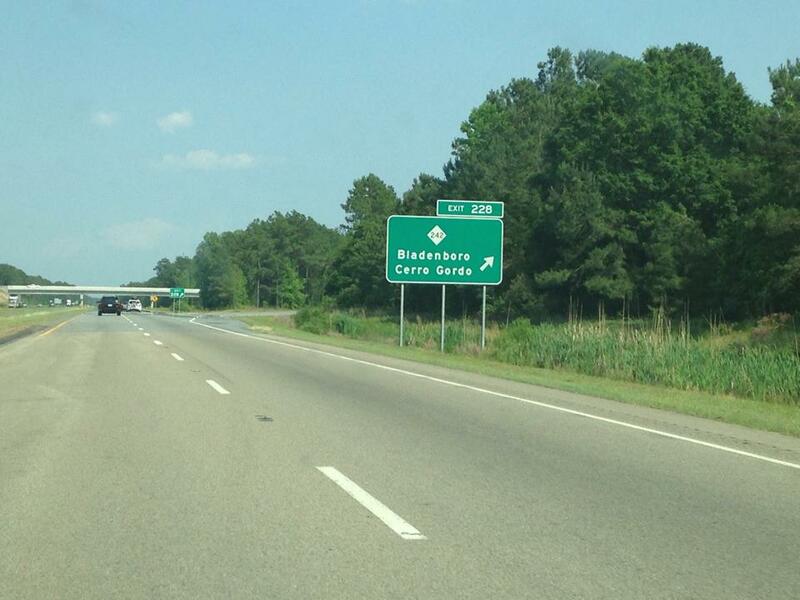 Photo of the then newly numbered exit sign for new interchange with NC 242, May 2014. NCDOT first held a workshop on July 11, 2006 to provide local citizens with information about the work and a companion project to upgrade the US 74/76 intersection with NC 211 near Bolton.5 Another meeting occurred on May 27, 2008. 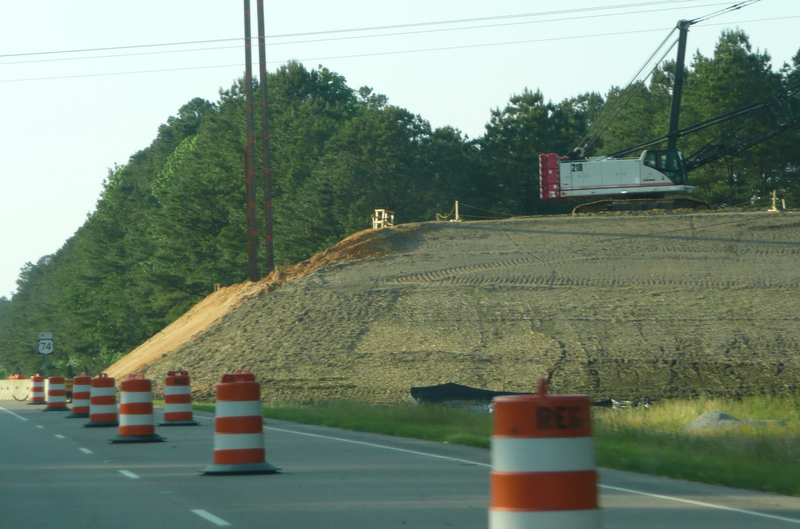 Right of way acquisition took place during 2009 with construction, delayed since 2006, starting in July 2010.6 NCDOT, as part of its 2006 press release, said it planned to upgrade US 74 to a 'fully controlled access route' aka freeway, between these two projects. 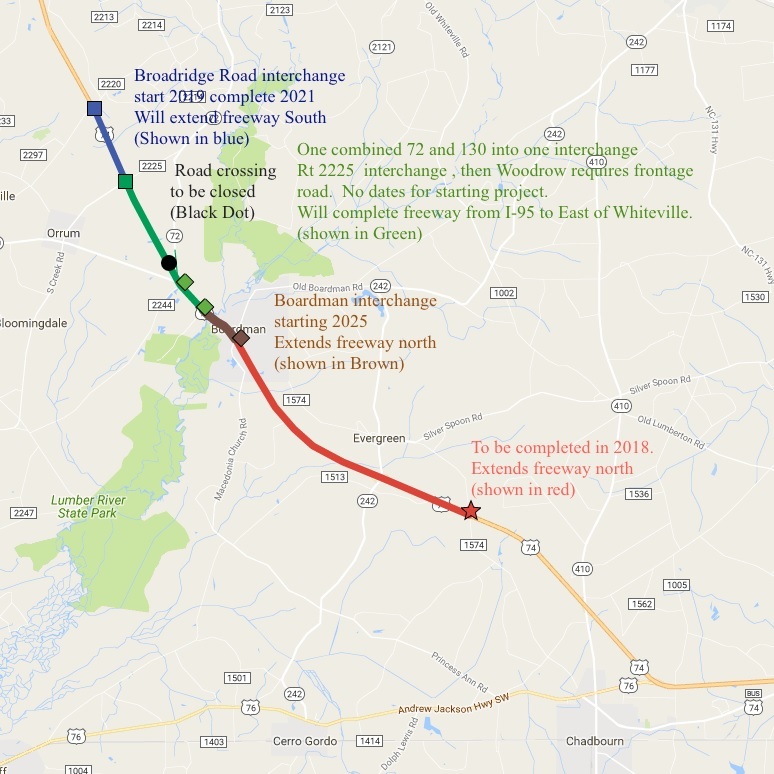 This would imply that, for this segment, the upgrading of about 7 miles of US 74 between the end of the US 74/76 Whiteville Bypass and NC 242. The cost listed for the entire project, $6.8 million, and the project length (.83 miles), however would seem to be too low to include upgrading the rest of US 74 along with building the new interchange.7 There already is an interchange built to the east as part of the previous US 74 upgrade at the intersection with NC 410/US 74 Business/East NC 130 that could potentially serve as an interchange for I-74, cutting down on the project cost. 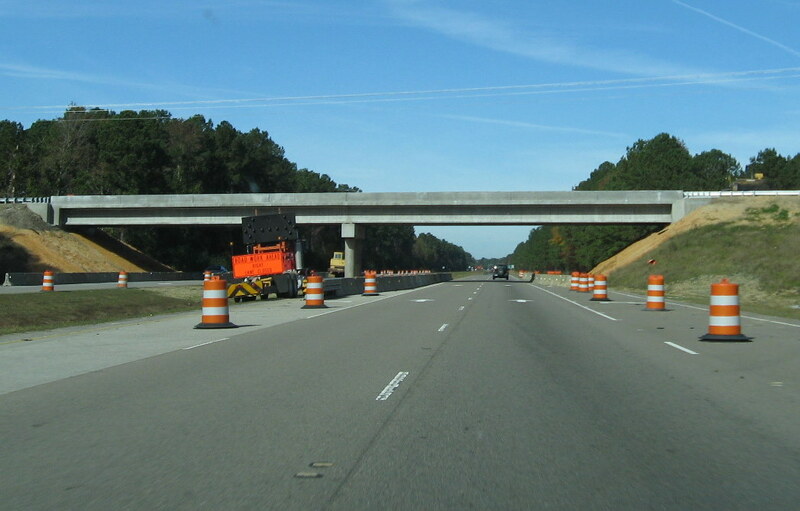 With the completion of this bridge there is now only about a 6 mile gap remaining between the two freeway segments between Lumberton and Whiteville. 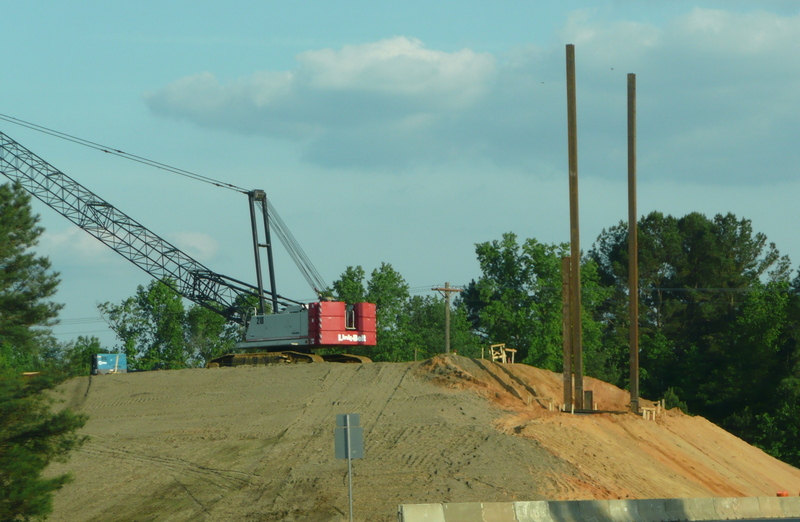 Here's the same construction seen from West US 74, the first I-74 exit sign can be seen when driving through this project (May 2009). Construction was to be complete in November 2009, but the contract was not completed until April 2010. 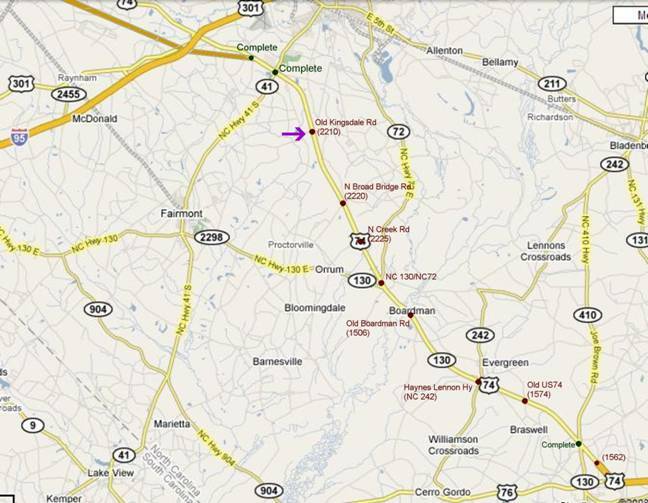 Map courtesy of Nick Zachetti, the location of Old Kingsdale Rd is marked by an arrow. 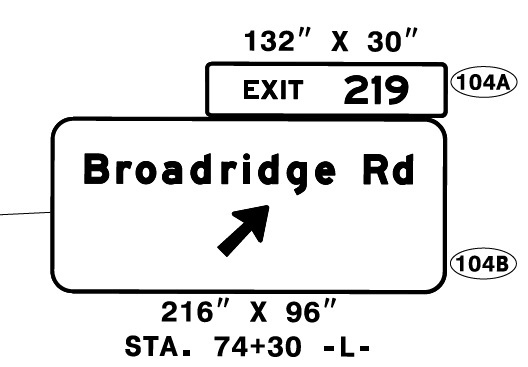 The connection to NC 72 and NC 130 West will probably be made through one interchange due to their close proximity. 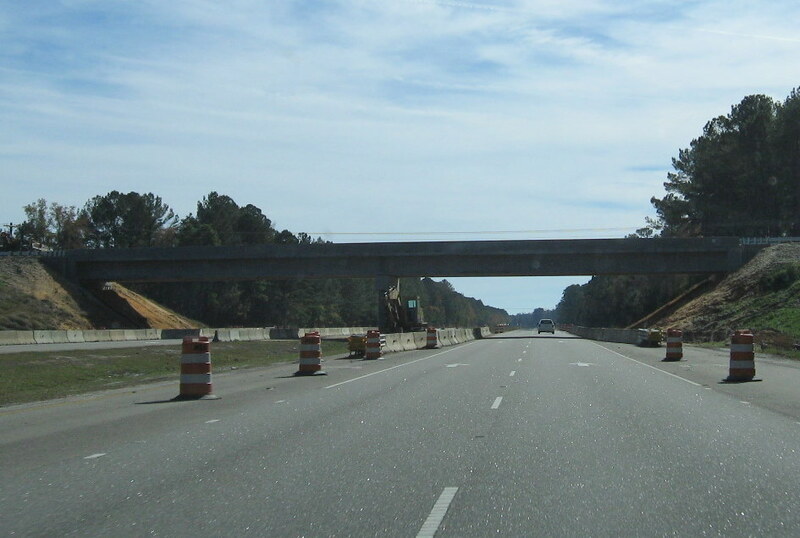 Tour I-74's future and current route along US 74 in Columbus and Robeson Counties on This Video courtesy of J. Austin Carter, from January 2013. Sources: Map image: NC State Transportation Map 2017-2018. (1) Former NCRoads.com, I-74 Page. (2) NCDOT. June 2011. 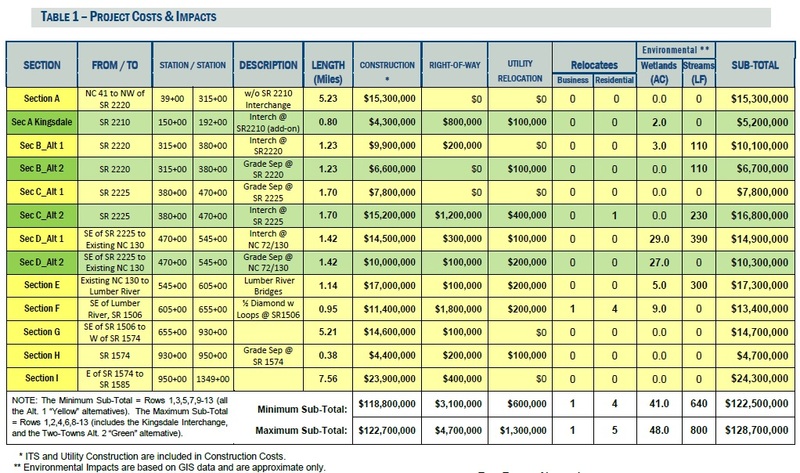 Construction Progress Report, Contract C202441, Accessed 6/20/11. (3) Information from post by Chris Curley in Facebook Group, SERoads, 7/7/13. (4) NCDOT. 2006. 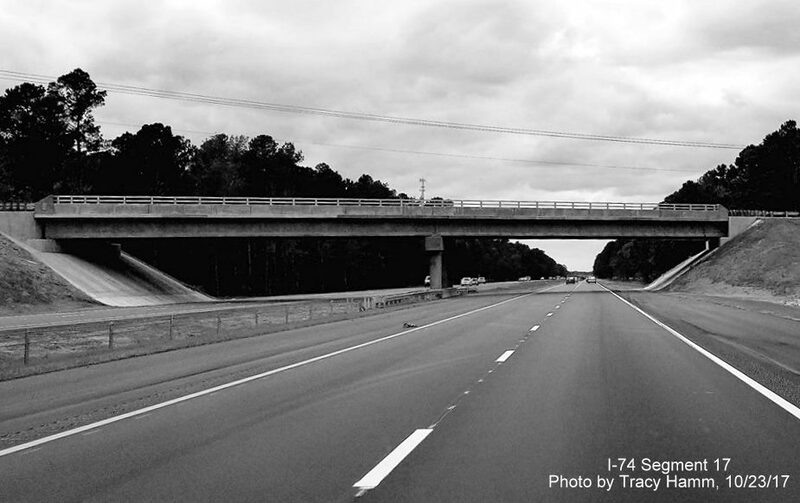 NCDOT Workshops July 10-11 for Proposed Interchange Additions Along U.S. 74 in Columbus County. Press Release, July 6. Project was completed before its 12/31/12 end date. (5) NCDOT. 2008. 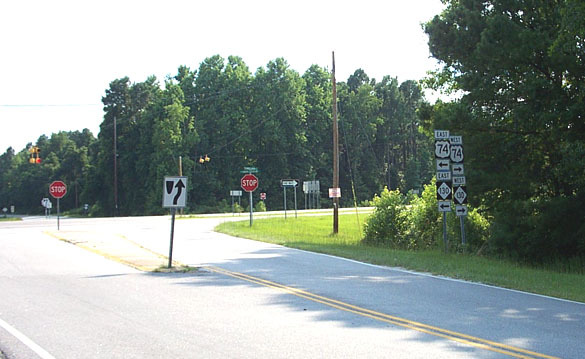 NCDOT To Hold Public Meeting for Proposed Interchange at U.S. 74/NC 130 at NC 242 Near Evergreen. Press Release, May 13. (6) NCDOT. June 2008. State Transportation Improvement Plan, 2009-2015, Division 6, Columbus County, p. 6-9. (7) NCDOT. June 2008. State Transportation Improvement Plan, 2009-2015, Division 6, Columbus County, p. 6-12. (8) NCDOT. 2012. Policy to Projects, Draft. September 5. Appendix 21: Division Six STIP Project List, p. 213. (10) NCDOT. 2019. Construction Progress Report, Contract Number C204013. Information downloaded from: https://apps.ncdot.gov/traffictravel/progloc/ProgLocSearch.aspx, April 1, 2019. (11) NCDOT. 2017. 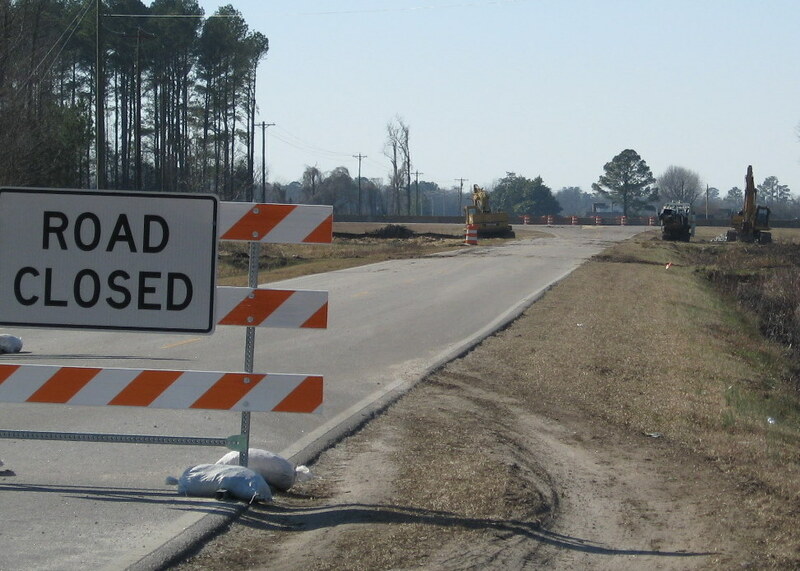 State Continues to Improve US 74 in Robeson County. Press Release, Nov. 2. Downloaded from: https://apps.ncdot.gov/newsreleases/details.aspx?r=14557, Nov. 6, 2017. (12) NCDOT. 2017. Sign Plan. Project R-5752, Robeson County. September 13. Downloaded from: https://xfer.services.ncdot.gov/dsplan/2017%20Highway%20Letting/10-17-17/Plans%20and%20Proposals/ROBESON%20R5752%20C204013/Standard%20PDF%20Plans/250%20Signing%20Plans.pdf, Sept. 20, 2017. (13) NCDOT. 2019. State Transportation Improvement Plan, 2020-2029, Draft, Division 6, Columbus County, p. 3 of 35; Robeson County, p. 20 of 35. (14) NCDOT. 2018. 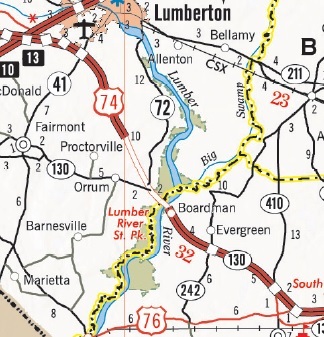 Proposed Conversion of The U.S. 74 / N.C. 72 and U.S. 74 / N.C. 130 Intersections to an Interchange, NC News, Public Meetings page, downloaded from: https://www.ncdot.gov/news/public-meetings/Pages/2018-12-03-R-5751.aspx, Nov. 19. (15) Information from post of Chris Curley in Facebook Group SERoads, 9/7/12. (16) NCDOT. 2019. State Transportation Improvement Program, 2020-2029, Draft. January 2019. Division 6, p. 3 of 35.